Try this circuit and expel unwanted guests from your Kitchen. This Ultrasound generator can scare Rats, Cats, Lizards etc by creating stress on their ear. Sound above 20 kHz is inaudible to human beings but lower animals can hear the ultrasound very well. The high pitch sound always create a hostile environment to animals and they try to avoid such situations. Power supply is derived from a 0-9 volt 500 milli ampere transformer with rectifier bridge (D1 through D4) and smoothing capacitor C1.Power supply and the circuit can be enclosed in a standard plug in type DC adapter box. IC1 is designed as an Astable multivibrator to give output pulses in the frequency above 20 kHz. Resistor R1, variable resistor (It should be a 22K Lin volume control) and capacitor C1. By adjusting VR1, the output frequency can be changed up to 60Khz.Usually lizards respond to 28 kHz, Rats 56 kHz, Cats 38 kHz etc. So adjust VR1 to get desired frequency. Since the sound in inaudible, it is necessary to find out the correct frequency through trial and error or calibrate the VR1 by testing the output in an oscilloscope. 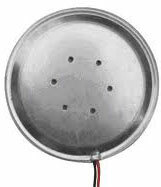 Use a Piezo tweeter as one used in telephone receiver. Ordinary buzzer will not give satisfactory results. Since the sound is feeble, the circuit is effective only in a confined area like a small room. Note : Animals are intelligent than us. They will adapt very fast to unfavourable situations. So sometimes they will comeback and sit on the pest repellent. So these kinds of pest repellents are effective only to new populations. Thank You for posting this. Does it work for snake? Snakes often come our home. Please give the frequency which repels the snakes. Thanks in advance. The Animal scarer is not useful to scare snakes. External ear is absent in snakes so they cannot hear air borne sound. They receive earth borne sound vibrations which passes through bones to the internal ear.